Well, it's already Week 2 of the Summer of Color 3 challenge. Once again the choice for this week, Hot Pink and Orange, is a favorite of mine. It's such a bright, summery combination, which makes me smile!!! I often use it in my garden containers. I love to garden and I take a lot of care in deciding what colors go in my different pots which are scattered around the garden. It's sort of an obsession really. But, when they're all planted I love looking at them and enjoying the combinations! I'm a color addict, remember!! Well, this week I have three different projects to share. Since I mentioned using the combination in my garden, I'll start with that. This is a pot of Million Bells, little workhorses of the garden. This is actually our umbrella pot! Years ago I saw a drawing of a pot full of flowers with a market umbrella in the middle. I fell in love with it and my absolutely wonderful husband put it together for me! We've had it for at least 20 years and it looks very vintage, which I love! 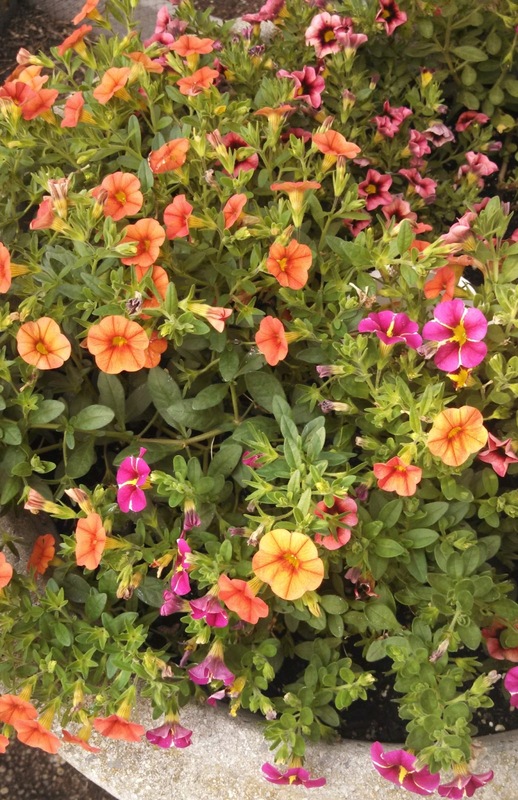 I have a different combination of colors and flowers in it every year. Next is a bracelet I made to wear to a wedding. It was a fun beaded bracelet using triangles shapes which are some of my favorite shapes to create to create in beads. I used a mix of colors but all in the pink/hot pink, orange and copper color range. It's a fun bracelet to wear because it's so cheerful. Like a party on my wrist! Next is a tag I just finished. 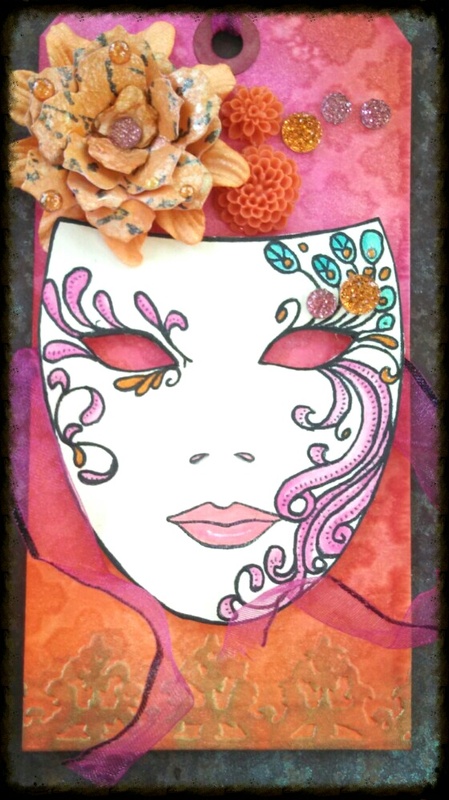 I love masks and I've had a mask stamp for several years and haven't done much with it. Just looked at and kept it where I could see it, so I could admire it! That's the kind of thing I do when I love something!!! Anyway, this week's colors gave me an idea to use it. I'm really happy with the finished project and I have to thank my very talented daughter, Carrie, and her friend, Maria, for giving me ideas on how to finish the tag. I'm really pleased with the way this turned out. So, these are my entries for this week. Thanks again to Kristin for hosting this challenge. It is such great fun! This color combo is so cheerful! The mask is a mysterious beauty and the bracelet has a great rhythm to it. That is a gorgeous piece! Love the flowers, I have a basket similar in my garden, gorgeous bracelet and very cool tag. Great job! Gorgeous! I love your pots of flowers - such a wonderful array of co-ordinating colours. The bracelet is beautiful (I do love your jewellry - sigh!) - very pretty and perfect for a summer wedding. The tag is fabulous - the mask is beautiful and I love the little orange flowers at the top - they look almost real. I'm running late with my SOC this week, hopefully I'll get posted a little earlier next week - that's the plan anyway!! Party on your wrist, indeed. What a spectacular bracelet. I think triangles are great with jewelry, but you don't see them often. I love how the mask tag turned out. The flower accents are the right choice rather than a word. wonderful uses of the colors! The flowers are a perfect example, as is this background for your blog! Your bracelet is beautiful. It looks like it was time consuming - congrats on get it all done in one week! Oh wow...that beaded bracelet is just divine...perfect for a wedding! Your flowers are stunning!!! The perfect first picture for this post!!! that bracelet is incredible, and I love the tag.